The name 'Bentley' is synonymous with motor racing. Designed and built by W. O. Bentley, 3-litre versions were successfully raced in the early 1920s. In 1926 Bentley introduced a 4 1/2-litre engined car. It was entered in Le Mans 24 hour race in 1927, won in 1928 and the following year took second, third and fourth places behind a 6 1/2-litre Bentley. Sir Henry Birkin and Clive Gallop, in conjuction with supercharging expert Amhurst Villiers, developed a 'blown' version of the 4 1/2-litre Bentley - much against Bentley's advice. Three were built initially and proved uncatchable although tending to be unrealiable. 'Tim' Birkin's lap record on the old Le Mans circuit was never broken. A fourth car was then developed and that incredible machine is the subject of this super nw kit. In this Sports Car he competed against racing cars, and in the 1930 French Grand Prix achieved 135 mph on the straight. He came second, averaging 88.5 mph for the 245 miles in a time of 2 hrs 46 mins. The car also competed in many other classic races of the period. 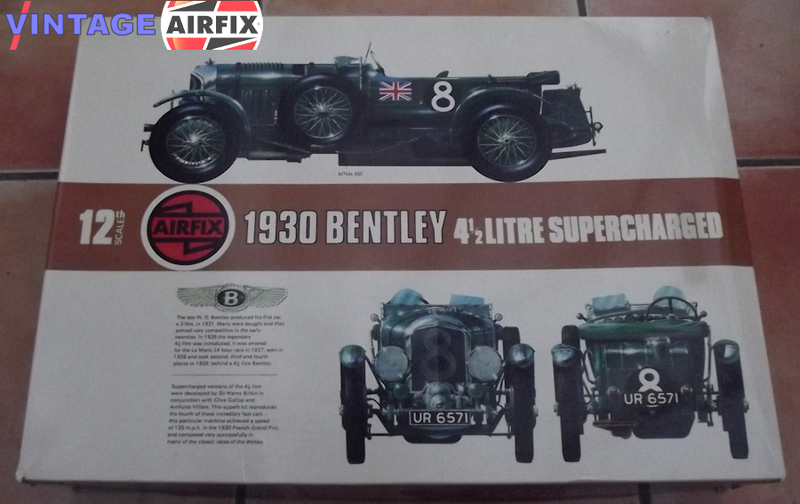 The present owner, Mr Neil Corner, has restored the Bentley to its original condition, and with his help and co-operation Airfix have reproduced this car for the modeller. There are 272 parts in this superb kit including rubber tyred wheels, plated radiator, supercharger etc. and opening bonnet revealing detailed engine, and it is a must for every enthusiast's collection.